With an Ally Like This … Who Needs Enemies? For years, Pakistan has insisted that bin-Laden was not on Pakistani soil. As we’ve already noted, Osama’s compound was big. It was eight times bigger than any nearby building. Hussein Haqqani, Pakistan’s ambassador to the United States, said his government “had no knowledge” of Osama’s whereabouts. In an interview broadcast on CNN Monday, he said, “If the Pakistani government had known that Osama bin Laden was there, we would have got him....We are very glad that our American partners did.” Haqqani noted that Pakistan is a large country. That would be more convincing if the army that was looking for him wasn’t located 100 yards away from the compound where he has lived for five years. Senior White House officials described Osama’s house as extraordinarily unique. So it seems clear that Pakistan has been playing us while gobbling up US military aid by the billions, ostensibly in the hunt for bin Laden. Knowing all the while that Osama was safe and sound in a safe house only 100 yards from their equivalent of our “West Point Army Academy”. If their officers are not trained to be more observant than this, they need to rethink their training program. 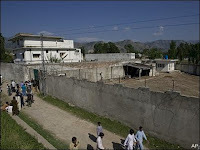 During a press conference in late July last year, Secretary of State Clinton specifically said that she believed Osama was in Pakistan and that the Pakistan government – particularly elements of its intelligence agency – knew his exact whereabouts. The conclusion is virtually inescapable. There is no way that compound could have been constructed without the government’s knowledge and assistance. The inference is that bin-Laden has been under the safekeeping of the Pakistani Army for almost a decade. But according to the State Department last week, Pakistan cooperated with the mission. If that is true, then it means the Pakistani Army gave bin-Laden up. And if they gave him up, they must have gotten something from us in exchange. Have We Won the War Against Al-Qaeda? No doubt one of the first reactions out of ‘Left Field’ will be the claim that now that bin Laden is dead, we’ve won the war with al-Qaeda and can begin pulling out of Afghanistan. With the killing of Osama bin-Laden, the United States has a great victory. Did we win the war? Hillary Clinton gave a press conference on Monday in which she urged the Taliban to abandon al-Qaeda and enter into peace talks. Clinton used the press conference to send a message to the Taliban leadership. Clinton’s comments came two days after the Taliban announced the launch of their spring offensive with a string of deadly attacks against government and military targets. The Taliban were allied with bin-Laden, but the Taliban existed in Afghanistan long before al-Qaeda arrived. There is no reason to believe they would disband because of bin-Laden’s death. A province-level commander for the insurgent group told the Associated Press that while the death of bin Laden was a loss, other al-Qaeda leaders existed who could step into his place. The commander, who spoke anonymously because he was not a spokesman, said that revenge attacks were certainly being planned. So it isn’t over. We won an important battle, but not the war. The forces of evil will try even harder to find a weakness to exploit.